A workbook-style approach, the 11th edition is perfect for incorporating activities and exercises into the classroom - and helps students master critical concepts as well as develop skills they can use in their professional lives. 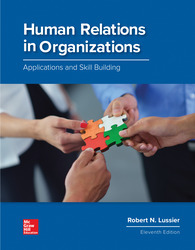 The 11th edition provides a balanced, three-pronged approach: a clear concise understanding of human relations and organizational behavior concepts; application; and development of skills. CONNECT: A highly reliable, easy-to-use homework and learning management solution that embeds learning science and award-willing adaptive tools to improve student results (applied & practical, results-driven technology).